What Are the Health Benefits of Peanut Butter & Jelly? 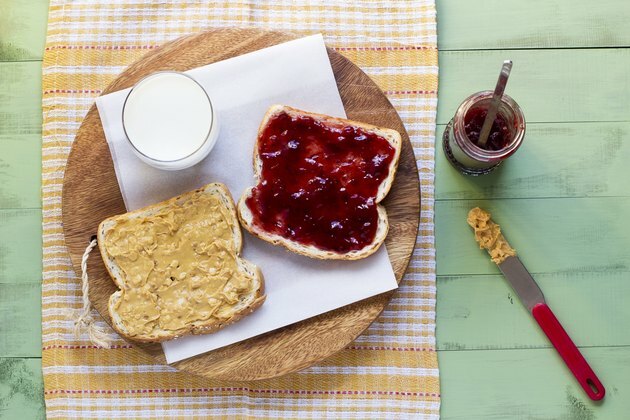 Peanut butter and jelly sandwiches are a staple in many American diets and the ingredients used are simple and inexpensive, but offer several health benefits. A serving of peanut butter is 2 tbsp. and a serving of jelly is 1 tbsp. A peanut butter and jelly sandwich is a good addition to a meal and makes a good snack, too. Peanut butter is grouped into the meat and beans portion of the Food Guide Pyramid. A serving of peanut butter contains about 8 g of protein and contributes to healthy muscles, skin, hair and teeth. Protein also plays a role in hormonal function and keeps blood healthy. The jelly does not offer much additional protein to the sandwich, but using whole-wheat bread does increase your protein intake. Jelly that is made from all fruit contains more fiber than other varieties and peanut butter contains 2 g per serving. Fiber is an important nutrient because it promotes regularity in digestion and helps control cholesterol levels. In addition, eating foods that contain fiber, peanut butter and jelly included, fills your stomach, helping to keep you feeling full for longer periods of time. This is important if you are watching your weight as it can help prevent hunger between meals. Peanuts are a good source of heart-healthy fats; peanut butter has some of these benefits. The unsaturated fats found in nuts can lower your cholesterol and reduce your risk of developing heart disease. They can also offer health benefits for your brain and skin, and give you an energy boost. Jelly is fat-free and in moderation, is a healthy part of a low-fat and heart-healthy diet. Vitamin E is an antioxidant found in peanuts; it can help protect your body from free-radical damage that contributes to the development of cancer and heart disease. Resveratrol is another antioxidant found in peanuts and peanut butter. It has the potential to protect you from cancer and heart problems, but also has anti-aging, anti-viral and anti-inflammatory properties, as well as offering protection for healthy brain function. Since jelly is made with fruit, you increase your intake of vitamin C when you consume it. This vitamin is important for immunity, wound healing and the health of your teeth and gums. Peanut butter is a good source of several B vitamins, which are necessary for your body to use the energy it gets from the foods you eat. Niacin is one of these B vitamins and a serving of peanut butter contains 24 percent of your daily needs. Getting adequate niacin could reduce your risk of developing Alzheimer's disease. Folate is another B vitamin found in peanut butter and helps prevent birth defects in gestating infants. Jelly contains trace amounts of some B vitamins. A peanut butter and jelly sandwich offers the benefits of a few minerals including potassium, magnesium, iron, zinc and calcium. Potassium is important for regulating a healthy blood pressure. Calcium and magnesium play a role in the health of your bones; zinc is important for vision and wound healing. Iron is a necessary nutrient for healthy blood oxygenation. USDA: Why Is It Important to Make Lean or Low-Fat Choices From the Protein Foods Group? USDA: Why Is It Important to Eat Fruit?